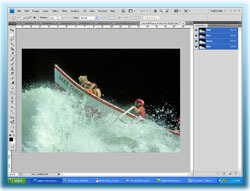 There's one task that is not explained very well in the Photoshop help documentation — nor is it described very well in the various tutorials that you'll find on-line. That task is combining or merging two or more separate paths into one. Let me give you an example. For this example, I'll assume that you have the "paths" panel attached to the side of your screen. 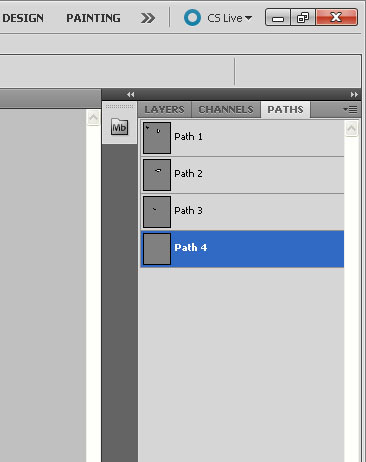 (If the paths panel is not present, you can access it by selecting Window >> Paths). Let's say that on your Paths panel, you have the following paths: Path 1, Path 2, Path 3, and Path 4. (See illustration to the right). Now let's say you want to combine those paths. How do you do it? As I mentioned, help information on this task is pretty sketchy. If you're dealing with layers, you would select the layers and merge them. But that doesn't work here. It's different with paths. Actually, it turns out that there's a simple way to combine them. Here's how. Let's say we want to combine all the paths together in Path 1. To do that, highlight Path 4 in your Paths panel. Then select Edit >> Copy. What you're doing is copying the path. Now select Path 1. Select Edit >> Paste. Presto! You've combine Path 4 with Path 1. Now you can do the same thing for each of the other paths. Highlight Path 3 in your Paths panel. Select Edit >> Copy. Now select Path 1 in your Paths pane and select Edit >> Paste. Wow! Now you have Path 1, 3, and 4. All combined. You know how to finish it from here: Highlight Path 2, copy it and paste it to Path 1. At this point, you could delete Path 2, 3, and 4, but you may wish to save them depending on your needs. I hope this has been helpful. Happy photoshopp'n!